Freedom moved away from the more poppy sound of the previous album, "Beyond Appearances" and back to the band's original Latin rock. 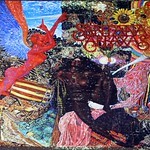 This is Santana's is the debut studio album by the San Francisco rock group Santana released in 1969. It is a release of largely instrumental music. 3 is the third studio album by Santana. The band's second self-titled album, it is often referred to as III to distinguish it from the band's 1969 debut album. The album was also known as Man with an Outstretched Hand. It was the third and last album by the Woodstock-era lineup, and it was also considered by many to be the band's peak commercially and musically, as subsequent releases aimed towards more experimental jazz and Latin music.